It’s a question that’s been asked in scholarly circles and around the dinner table for decades: Does music make you smarter? An ever-growing body of research suggests that the answer to that question is overwhelmingly yes. At Bach to Rock we don’t really need stacks of research to show us that music profoundly affects students of all ages — and on many levels. Our franchisees and investors certainly see the educational benefits of music education because many students who come to Bach to Rock build a strong musical identity, and almost all develop a passionate and informed appreciation for music. Even if they don’t grow up to be professional musicians, the self-confidence and joy that comes from learning to master a set of drums, the mandolin, classical guitar — even their own singing voices — equips them with valuable skills they can tap into over a lifetime. We see our students’ lives improve on so many levels. In fact, transformations are quite common within the walls of our school, and they take many forms — academic, social, emotional, behavioral and more. A popular poster sold in music stores says, “Music makes everything better.” It’s hard to argue with that statement. We certainly see it at Bach to Rock. Every child comes to us with a unique story and an individual set of circumstances, yet music has an almost magical ability to seep into each child’s life and improve it — often dramatically. Here are two scenarios that illustrate how students can grow at Bach to Rock. A bright sixth-grader does well in school, with mostly A’s and a couple of B’s, but she has yet to find an extracurricular activity that really excites her. She gains confidence and grows as a leader from her experience as a lead singer in a pop-inspired band at Bach to Rock. A 13-year-old has high scores on IQ tests, but his achievement at school doesn’t always reflect it. Not that he’s a poor student; there’s just a little spark missing from his overall performance. After learning to read tablature — the complex way chords are fingered from fret to fret on a guitar — he gains a quiet confidence, and when it’s time for him to start high school, he’s ready to tackle the social and academic challenges. When he’s a 16-year-old sophomore, he decides to major in music when he goes to college. 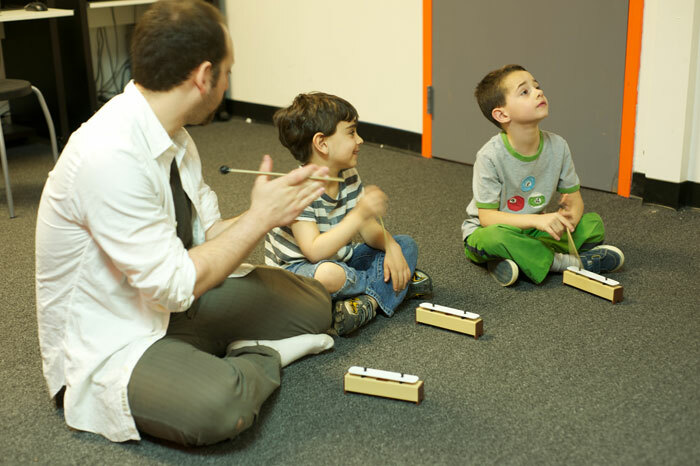 Even though we don’t need hard data at Bach to Rock to know that music education can have a positive impact on everything from IQ to hand-eye coordination, it’s still illuminating — and a lot of fun — to read what the research says. There are thousands of pages of research available on the internet and on the shelves of libraries on the benefits of music. It shows that music and music education improve intelligence, creativity, self-image, ability to set goals, dexterity, listening skills, confidence, work ethic, reading and problem-solving skills, short- and long-term memory, patience and fine-motor skills. 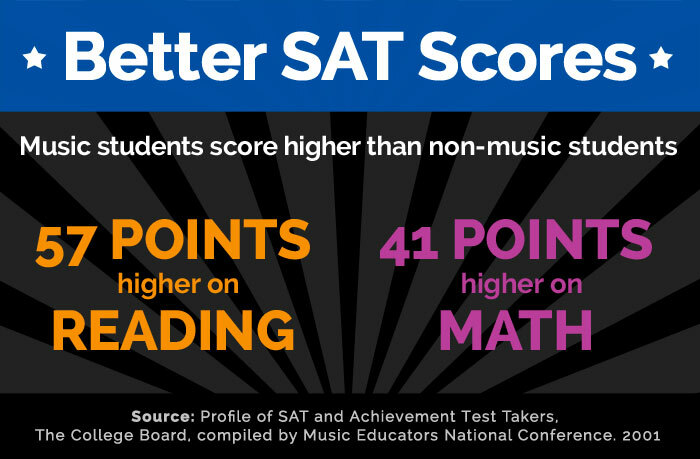 A study at Mission Viejo High School in Southern California showed the overall grade-point average of music students was 3.59, while the overall grade-point average for non-music students was 2.91. Brain scans of 9- to 11-year-old children have revealed that kids who play musical instruments have significantly more gray-matter volume. An in-depth Harvard University study found evidence that spatial-temporal reasoning — the ability to solve and put things together into a whole — improves when children learn to make music. One study conducted by the Commission on Drug and Alcohol Abuse found that college-age musicians who took music lessons as children are emotionally healthier than their non-musician counterparts. The Associated Press reports that college admissions officers cite participation in music as an important factor in making admissions decisions. 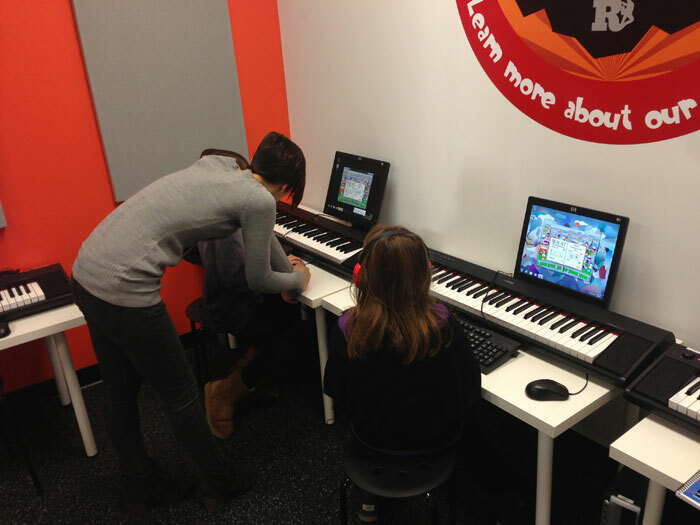 They claim that music participation demonstrates time management, creativity, expression and open-mindedness.